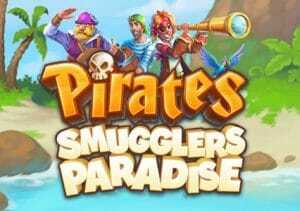 Ahoy shipmates, we’re off on another seafaring adventure in Pirates – Smugglers Paradise. Created by Yggdrasil Gaming, it’s a 5 reel, clusters pays video slot. Get on a roll with the symbol drop wins and you could boost payouts by up to 10x. There also the pick of 3 free spin features. Play on your PC, tablet or mobile from between 20p and £100 per spin. Yggdrasil Gaming are at the top of their game on the design front here. A deserted cove forms the backdrop to the action. The reels are set within the sails of a pirate ship. Joining the lower value playing card suits are bottles of grog, pistols, the pirate skipper, cutlasses and even a pirate’s hook hand. It’s done cartoon style and very easy on the eye. To land a winner, you’ll need to find 6 of the same symbol in a cluster. The rest of the symbols on show are then removed from the reels and a new symbol drop takes place. If a new matching symbol joins the original winning cluster, then the process is repeated. The symbol drops end when no new matching symbol hits. A payout of the whole cluster is then made. This is called the Dropdown Wins feature. If you manage to land 2 or more rows with matching symbols, the payout will receive a multiplier boost – from the Multiplier feature. Multipliers of 2x, 3x, 5x or 10x are on offer if you fill 2, 3, 4 or 5 rows with the same symbol. High Seas Free Spins feature – the lower value heart, diamond, club and spade symbols are removed from play if you choose this round. Multiplier Madness Free Spins feature – in the base game, multipliers reset to 1x at the end of a symbol drop sequence. If you choose this round, the multipliers are in play throughout the feature. Win Fall Free Spins feature – at the start of each symbol drop, 2 extra winning symbols are added to increase the size of the cluster. There’s no shortage of pirate-themed video slots on the online casino virtual oceans. Pirates – Smugglers Paradise is one of the better ones. The design is as high spec as you’d expect from a game from Yggdrasil Gaming and there’s plenty of variety on offer from the features. The streak style symbol drops are a good addition and the free spins have the potential to deliver plenty of action. Get lucky there and you could find plenty of doubloons in Pirates – Smugglers Paradise – to the tune of 1,243 times your total bet with the 10x multiplier. Saying that, I would rather play the more volatile Dark Vortex from Yggdrasil Gaming which can reward you with 7,318 times your bet on every Vortex Spin/free spin!